TIFFANY STERLING HOLLOWWARE: English King, Chrysanthemum, Hampton, Winthrop, Tea sets, Dinner Plates, Trays, Loving Cup Water Pitchers and many other great pieces. Fabulous and unusual Tiffany Sterling Silver Single Ice Bucket with cover, silver plated ice insert and two handles. The height to the top of the handle is 7 3/4", the diameter of the top is 8", the bottom diameter is 6" and the capacity is 3 pints. There has never been a monogram. The condition is excellent except for a small impression on the bottom which pictured. The marks are pictured. Sterling silver very heavy water pitcher by Tiffany & Co., Pattern no. 22625 and was produced between 1907 through 1947. Excellent condition and professionally polished. Dimensions: H 10 1/4", W 8 7/8". 4 1/2" pints. Weight: 33.5 troy ounces.The marks are pictured. 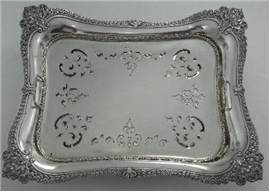 Sweet Meat Dish by Tiffany & Co. sterling silver. Fabulous Sweet Meat Dish by Tiffany & Co. sterling silver with beautifully designed monogram. The top of the oval dish is adorned with flowers, leaf branches and scrolled rope-like edge. The dish is raised on a pedestal with four shell form feet surrounded by leaf branches. It is in excellent condition, albeit the center of the bowl has normal surface scratches. Overall approximate dimensions: height 2 5/8"; length 7 5/8"; depth 4 1/2". Weight is 8.52 troy ounces. "TIFFANY & Co / 7122 MAKERS 8520/ STERLING-SILVER / 925-1000 / M". The pattern number 7122 was done between 1882-1883. TIFFANY & CO STERLING SILVER WATERMELON FORM SERVING BOWL OR DISH The bowl sits on four ball shaped feet and has wonderful leafy handles. It is in excellent condition and professionally polished with no monogram. The length is about 10" from handle to handle, the width is 5 1/4", the height is 1 1/2", the weight is 8.46 T oz. This is an important Tiffany & Co. sterling silver coffee and tea service in the classic English King pattern. Sterling silver creamer in the English King pattern by Tiffany. The overall height is 4"; the overall width is 5 7/8"; the weight is 8.17 Troy Oz. The condition is wonderful; the pattern is clear with nice oxidation. 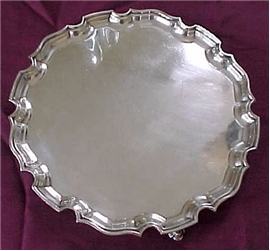 (SOLD) Handsome 12 1/4" sterling silver footed salver, made by Tiffany. The condition is wonderful. The weight is 30 Troy Oz. There has never been a monogram. The photos say it all! Also the marks are photographed. Handsome sterling silver basket by Tiffany. The condition is wonderful. The height, over the fixed handle, is 11 1/2"; the length is 6 5/8"; the width is 4 5/8"; the weight is 16.9 Troy Oz. There is a pretty script monogram K.S. in the cartouche.